World Medical Mission post-residents care for the suffering and help mentor local physicians. Samantha Conroy never dreamed about being a doctor. She was the kid who fainted at the sight of blood. So when Samantha attended Carnegie Mellon University in Pittsburgh and majored in biology, she thought she’d get her Ph.D. and do research. Dr. Samantha Conroy is serving in Kenya through the World Medical Mission Post-Residency Program. But as God worked in her life and she surrendered to His Lordship, Samantha saw God clearly leading her to medical school at what is now called Geisinger Commonwealth School of Medicine in Pennsylvania. On the very first day of classes, she watched an open-heart surgery and didn’t pass out. Following her residency in family medicine in Waco, Texas, she applied to the Post-Residency Program with World Medical Mission—a ministry of Samaritan’s Purse. Since the beginning of this year, she’s been serving at Kijabe Hospital in Kenya. The Post-Residency Program is a fully funded two-year program for Christian physicians and their families who have been called to medical missions. 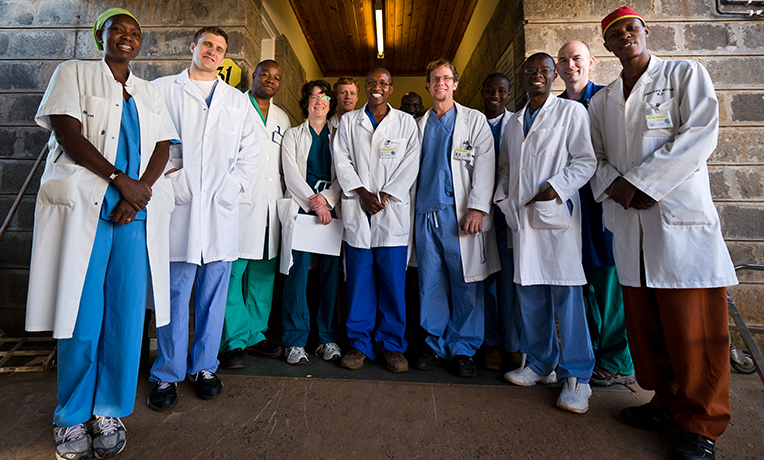 We place medical personnel at a mission hospital where they will serve within their specialty. During his residency in pediatric surgery at Vanderbilt University Medical Center, Dr. Erik Hansen heard about Kijabe Hospital and learned how our Post-Residency Program could afford him and his wife, Amanda, an opportunity to serve as cross-cultural missionaries. They applied and were accepted into the program. “Samaritan’s Purse is incredibly generous in how it supports its Post-Resident physicians and their families, and it was a true blessing for us,” Erik said. Once their two-year commitment ended, Erik and Amanda connected with Serving in Mission (SIM) and have returned to Kijabe as long-term medical missionaries. Erik is the program director for the pediatric surgery training program. “Being the hands and feet of Christ to the suffering children and their families is an honor and a blessing,” he said.